Beatles or Rolling Stones? It was always the million-dollar question, wasn't it? The Beatles visited Australia in 1964. In addition to 5000 screaming (mostly female) fans, they were also greeted on arrival at Brisbane airport with a small mob throwing rotten fruit and eggs (they must have been Stones fans), as well as some holding placards saying "Haircuts only 5 bob" (those signs also had a rainbow motif - g'day Stefan!). Despite this mixed welcome, they played a concert at Festival Hall on 30th June of that year, and I am sure that many still remember it. The Beatles stayed at Lennons Hotel in the city (more on that later), and I doubt that they would have visited Teneriffe. Yet there is a link to the Fab Four here. One of the wool stores that existed down here back in the time that Australia was riding the sheep's back was a fairly large brick edifice run by the Goldsbrough Mort Company Limited. Here it is in the early 1930s. As usual, the picture deserves closer inspection. The railway in the foreground was part of the Newstead line that serviced the sugar refinery, the power house,the wool stores, the wharves, and the canning factory. It is no longer used, and although remnants of the tracks can still be seen in certain places, they have largely been dug up or covered over. Examples of the motor vehicles of the day are parked in front of the building, and there are decorative rams' heads fixed at various points on the front of the building, further emphasising the purpose of the warehouse. The greenery softens all of that brickwork, but otherwise, the building has held up very well. Inside it (I have friends who live there - lucky me!) 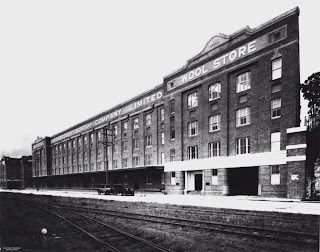 there are photos of the old wool store including a very large print of the top photo in this post, as well as memorabilia from the days when wool ruled the wharves. The rams' heads are still there, almost like gargoyles. And the building is now grandly called "Dakota Apartments", replicating the name of the New York building outside of which John Lennon was shot back in December 1980. Typically, there are also commercial tenants on the ground floor, including one called "Sparkle Dental", presumably where we Teneriffians can go to get all those coffee stains removed from our teeth. Again, I have tried to make my picture as similar as possible to the original. A tree (you can see some of the branches) has been planted right where I needed to stand. Honestly, some people must have nothing better to do than plant trees. (Memo to greeenies: that is meant to be HUMOROUS! Please don't stand outside waving placards and singing "Kumbiya".) And the original picture was probably taken with what we now call a view camera, where the lens moves independently to the camera body, thus allowing the photographer to present the building with square corners. My camera, with a wide lens, makes the building taper in at the top. Only tall thin people can live on the top floor these days!